Because that second response is the one I have to approximately 75% of the blogs I read, even the ones I love. I read, I judge, I read, I roll my eyes, I wish I had time to look cute all the time, I read, I feel less content with my own wardrobe/apt/life, I consider how to make my dinners look better photographed, I read, I judge, I contemplate how I am simultaneously bored and fascinated by Internet Over-sharers, I read, I wish I didn’t love judging so much, etc. Because that is what bloggers and blog readers do. We curate our lives to share only the best so that others read it and then they think the worst. This is how the modern world goes. Sometimes I wonder if we spend more time living our lives, or figuring out how to present it to others. But, reality hits this week as I start back to full time classes and teaching. And so, I wanted you to have a realistic look at my semester so that you could understand my desire to spend the past week dwelling on the happy pretty times. Because on Wednesday, I start reading this stack of books. Yep, me and Proust. For four months. No end in sight. No happiness or sentences shorter than a page in sight either. I am told that no one likes Proust. We shall see. 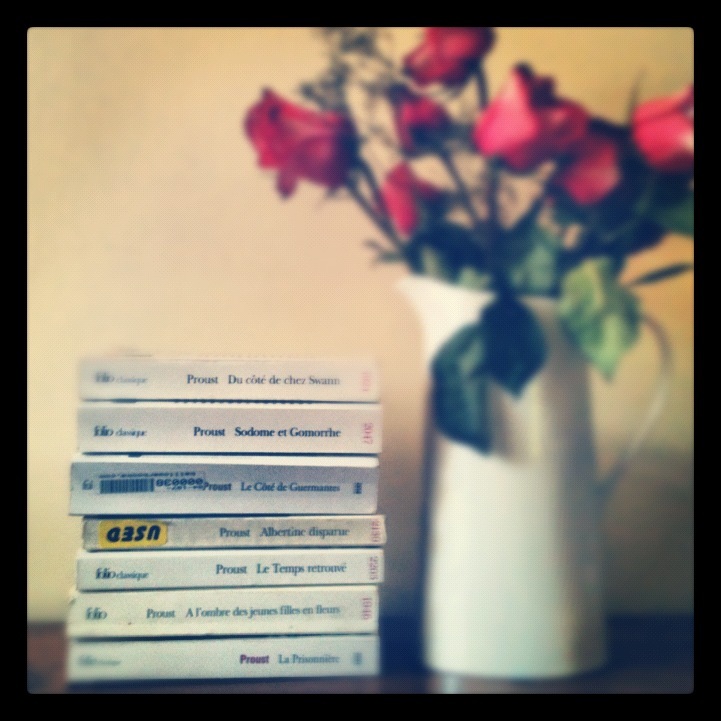 This entry was posted in Uncategorized and tagged books, confessions, French, iphone pics, literature, Proust, school. Bookmark the permalink. I keep hearing about this Proust character… I’ve never read him, but the more I hear about him the more I’m glad I haven’t. So, good luck with that dude. 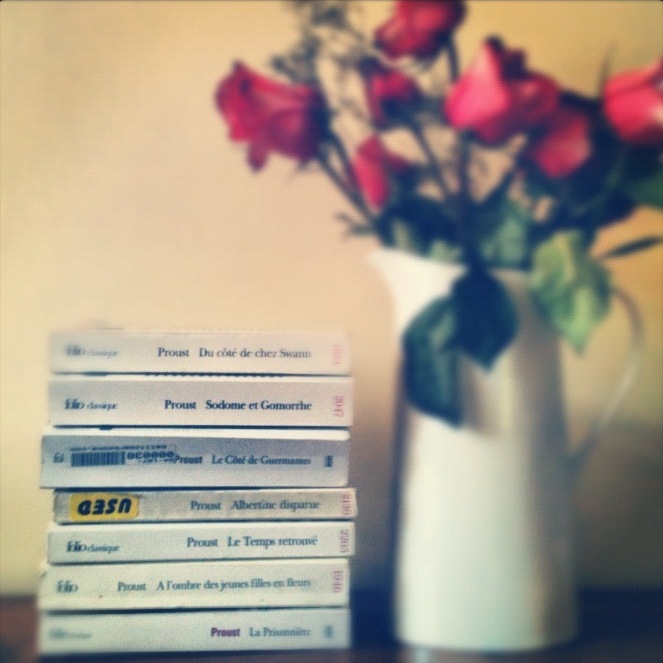 I’m sure that by the end of this semester, you will feel like you’ve read Proust too. Oh the joys of living with French scholars! It makes you put in your date of birth to see this video clip because the movie is rated R…but there is nothing bad in the clip, I promise. It’s very appropriate to this post. Love this. Only the French would relish the sad times more than the happy. GET IN TO MY ARMS. Let’s embrace for a long time. You wrote everything I’ve wanted to say. I’m going to go take a picture of my coffee now. We should be pen pals. For real this time. And I eagerly await pictures of your coffee. Bonne lecture! Je n’ai jamais pu lire Proust en entier..
Ha! You speak the truth, Hannah. You are AWESOME! 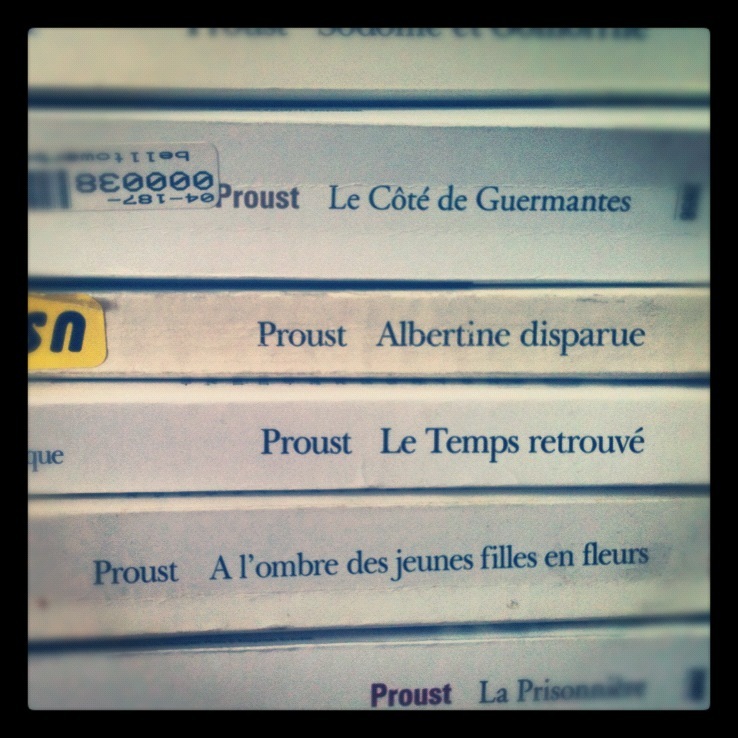 Millions of years ago, I seem to remember enjoying Proust. or maybe just the madeleines……. My plan is to eat piles of madeleines as I read, which I feel will improve the reading drastically.